It was a lazy weekend afternoon and we were spending the time in a very relaxed manner, strolling the quieter lanes along the Aoyama-Omotesando residential district after a heavy lunch at Great Burger. It was a deliberate decision to stay away from the busy shopping streets which meant a slight detour and a bit of elevation overcoming since that area isn’t exactly flat terrain to start with. 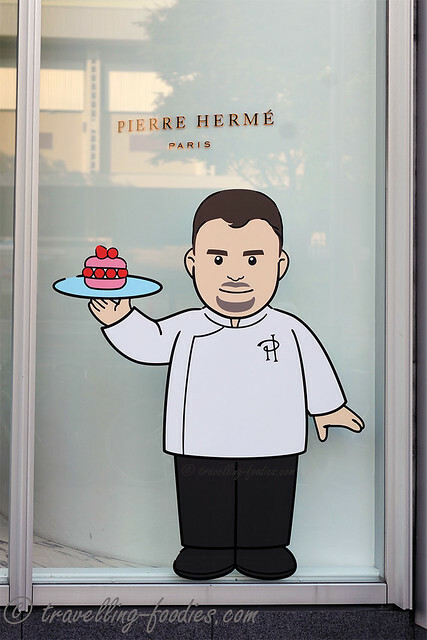 Finally we reached Pierre Herme’s flagship store in Aoyama and ordered some all-time favorites which most dessert afficionados would love and any pastry chef must have under his belt, i.e. 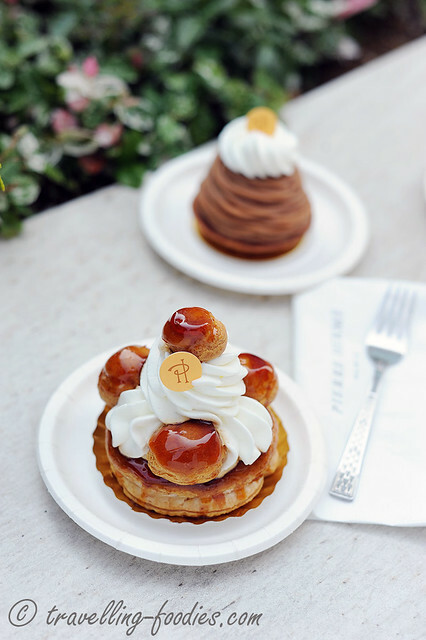 the Mont Blanc, a Saint Honore au Caramel and a passionfruit and orange cheesecake under his ‘Satine‘ Fetish series. 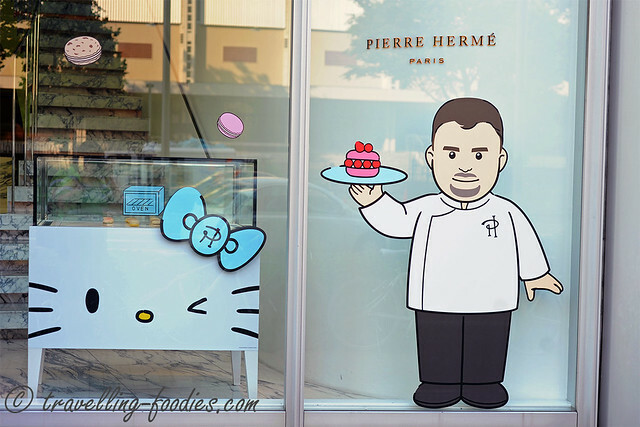 And yes, we finally had to face with the harsh reality that it was a weekend afternoon afterall and to be able to get a table at Pierre Herme, what were we even thinking?! Yes there is seating on both the 2nd and 3rd floors but even then there was a little queue that stretched all the way to the stairway landing on each floor. To make things worse, the ladies who were already seated were having a world of a time chit chatting, exchanging gossips while nibbling PH’s desserts and sipping teas from his selection without the slightest intentions to leave and in total oblivion to those who were queuing. Yes PH is into teas now as well in case you didn’t know! Then again they were not obliged to and if I were them seated all comfortable and cosy amongst like-minded friends, be it about with the pastries or the gossips, I wouldn’t too! Hence, we opted for takeaways instead, saving that additional service charge at the same time! Thankfully there was some open space in the adjacent building, which housed St. Marc incidentally where we tried to get a table but couldn’t as well! By a stroke of good luck, the weather was on our side, still bright and sunny (for good lighting) yet chilly at the same time, to ensure that any mousses or creams would stay intact for a longer time! After getting the pastries out from the box they were so delicately packed in, and plating them (Yes but of course, we brought along our own dessert plates and cutlery like duh!) we were ready to take some quick photos, but not without attracting some attention from curious passers-by of course, and we were ready to dive into them! St. Honore au Caramel, a real French classic that celebrates the use of choux pastry, which in PH’s case were very well made Despite not being the more crisp as I’d hoped them to stay as, the individual choux pastry balls as well as the ring base stayed rather perky and didn’t soften to become limpish, a common curse amongst choux pastry creations like Choux a la Creme, Eclairs, Paris Brest etc. 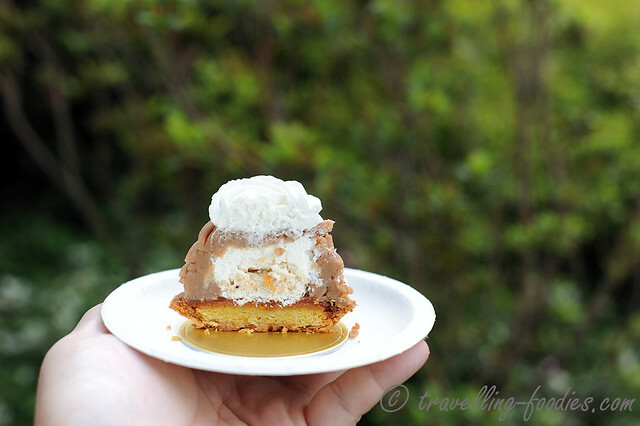 What I love was the juxtaposition of the somewhat bitter hues of the caramelised sugar on the choux pastry components against the sweetened Creme Chantilly. On their own, they would probably taste out of place but when put together, they strike a perfect balance in flavours. Yet another much loved French Classique, the Mont Blanc à Ma Façon. 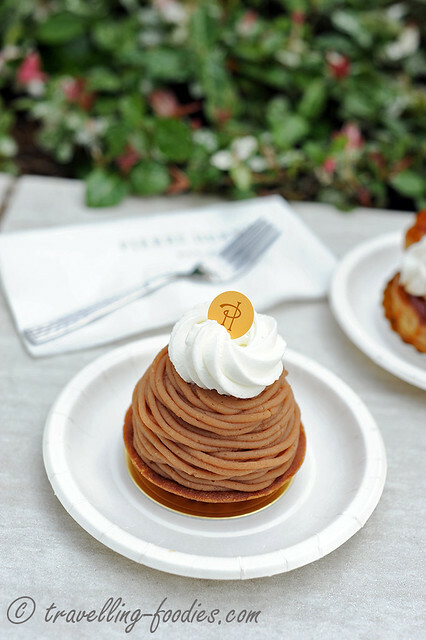 Mont Blanc is so popular in Japan, especially amongst the Japanese ladies it is a staple at many patisseries make available all year round. And different pastry joints actually have their own versions, ranging from the traditional ones with chestnut to those infused with Japanese elements like matcha, sweet potato and even sakura during hanami season. The version at PH uses a small tartelette aux frangipane as the base which was nice and buttery. Then it gradually builds up with other standard components like italian meringue, pate de marron, creme au marron, creme chantilly and bits of marron glace. Of course PH has Mont Blanc in his “Fetish” series but this is his no-frills version without any hints of Ispahan or Sarah or Montebello in it. I feel that it is a very good rendition, just that it lacks the ‘surprises’ which are often tagged with sampling PH pieces. I like the prominent flavours of rum coming through the piece which is what makes this piece such a “vintage” like sampling a little bit of culinary history. The execution is good enough for me to like it but would probably appear boring to others who are seeking for something different and more exciting in a PH store. Who wouldn’t? 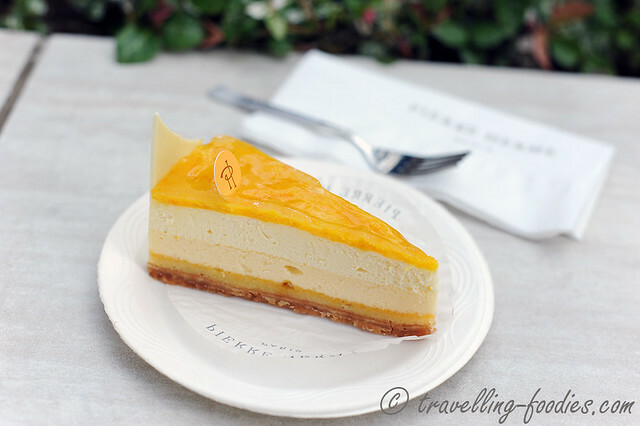 Finally, a cheesecake which was in season and one of my favorite combination of flavours incidentally. Infiniment Satine is a marriage of orange and passionfruit, a good deviation from the customary mango and passionfruit pairing. It consists of a pate sablee cookie dough crust base, biscuit cuillère au jus de fruit della passion, a layer of baked cheesecake followed by a cream cheese mousse, finally topped with orange marmalade. I liked the idea in the construction and the complexity of the components though I’m not exactly sure if everything worked well. Firstly, the finger biscuit was soaked with the juice from passionfruit, just like how it would have been used in a tiramisu albeit with coffee. But that affected the shortcrust pastry base which became a tad too soggy for my liking. It wasn’t bad if one doesn’t imagined it to be a standard cookie crust which really ought to be crisp and buttery, because it was not crisp at all! I like the contrast in textures of the two cheese components, with the baked layer being denser and wholesome, while the cheese mousse was delicate, fluffy and light. The magic lies in the orange marmalade topping that used Seville oranges, acrid with prominent bitter tones. It cuts through the richness of the cream cheese, making it less cloying and thus a lot more enjoyable. On the whole, the experience of sampling PH’s standard French classics was rather enjoyable. Yes one may not get the thrills and excitement that come from his more creative pieces but in exchange, what we enjoyed was rather fine pastry making. Void of the distraction of the surprise elements, one really gets a good look into the techniques employed into the various components that amalgamate the pieces. I still miss his other works like the Ispahan or Envie-themed creations of course, but would be more than glad to try other “no frills” classics should I chance upon them again in future. 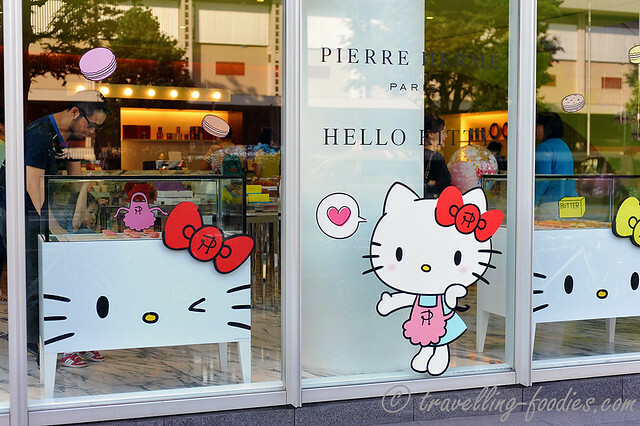 This entry was posted on December 25, 2015 by Alan (travellingfoodies). 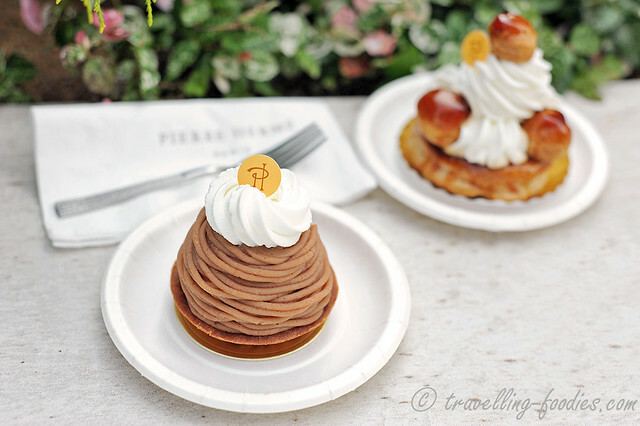 It was filed under Food, Travel and was tagged with aoyama, caramel, cheesecake, fruit de la passion, infiniment satine, mont blanc, omotesando, passionfruit, Pierre Hermé, st honore, Tokyo.